Here’s a little Monday morning inspiration… I am aways looking for ways we can bring in mentors and interesting, relevant STEM projects for our students. I had never thought of the potential in exploring GIS (geographical information systems) into the lesson. I really liked how each of the three highlighted projects dealt with issues the students faced in their community. Geographic information systems are essentially large databases that are able to connect entered data to a geographical reference point. Interesting Stuff in my my inbox: Geography, Literature,Jeopardy and Bingo! 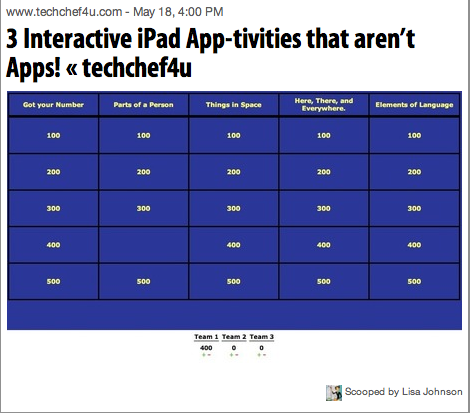 And my favourite, once again a post from Ms. Johnson ( I should just stop writing this blog and simply send you links to her blog), a post about activities to do on the iPad that are not apps, including jeopardy and bingo!